This month's Where in the World Are You Reading theme is Bookishness Around Town, hosted by Trish. My town is Indianapolis and there aren’t too many famous authors who originated here. 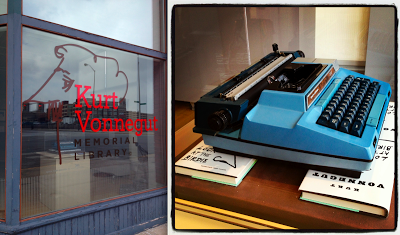 The most famous, by far is Kurt Vonnegut and a couple years ago the Kurt Vonnegut Memorial Library was opened in his honor. It’s really more of a small museum than a library, but anyway that’s what my bookish post is about! Above you can see the front of the building and Vonnegut’s actual typewriter. The famously sarcastic author was taken by the Germans as a prisoner of war during World War II and survived the Dresden bombing. His fictional alter ego, Kilgore Trout famously said the line “Life is no way to treat an animal,” and Vonnegut included it in his ever-optimistic style… on a tombstone. My favorite section has a recreation of his workspace; a low coffee table that he would slump over and his tapped away to create his novels. They included every detail, from his rooster lamp, to his choice of chair. There is also a gallery containing artwork drawn by Vonnegut and inspired by him. It has an interactive TV with interviews regarding Vonnegut’s life. There’s a long mural timeline along one wall noting important dates throughout history. A couple glass exhibit cases include his war medals and family letters, photos and memorabilia. So thanks to Trish for hosting Where in the World are you Reading. If any of you make it to my corner of the world I hope you’ll make sure to visit the Hoosier state’s ode to Vonnegut. Photos of the Kurt Vonnegut Memorial Library by moi. That's wonderful, and if I ever make it to your part of the world I'm SO going to visit. Thanks for the virtual tour! Oooh, I want to visit. Love Vonnegut. It's great that they reproduced his workspace like that. What fun! Thanks for the tour. I love the combination of tribute and library. Vonnegut is on my must-get-to(again) list. Thanks for this! Glad you enjoyed your visit. So cool! I love it. I need to read more by him, for sure. Wonderful to have this in your city! I didn't know Vonnegut drew as well. I'd love to visit. I love how colorful the museum appears to be! I haven't read any Vonnegut but I wasn't aware that he was taken as prisoner during WWII. Bet that would be fascinating to learn about. Thank you for all your participation throughout the past few months. I've loved seeing everyone's bookishness in their own part of the world! Ana - It's a little bit out of your way, but maybe one day! Rob - Isn't that fantastic! They have a photo of his work space up next to it. Ali - I thought that was interesting too. It's really more like a museum, but you can borrow books too. Care - There are still some major works of his that I need to read. Vonnegut Library - Thank you guys for wonderful work you do! Sarah Reads Too Much - I would recommend one of his nonfiction books, like A Man Without a Country, for something a big different from his other work. Belle Wong - He did some really great illustrations and doodles. Suey - I want an old school typewriter so bad! Trish - It was so interesting to learn more about him. It makes me proud that he is a Hoosier. I loved participating in the Where in the World posts, so fun! I would love to visit this library! Thanks for featuring it - I didn't even know about it until now. That's a wonderful library to have in your neck of the woods. My husband's family originates from Indianapolis. Kurt Vonnegut is one of my favorite authors. Slaughterhouse-Five is probably my favorite book (if I had to pick just one! ), and I'm in the middle of Player Piano right now. The last time I read it was close to twenty years ago. These books are definitely worth revisiting. Brenna - I hope it get a little more attention. It's a great place and there aren't that many literary places to visit in the Midwest! misfortuneofknowing - I agree, I've appreciated Vonnegut's work at different points in my life and I'm looking forward to returning to it in the future.